I’m writing this as a thunderstorm is making its presence felt outside. There’s no rain at the moment, but there are rumbles in the distance and I wouldn’t choose to go outside without an umbrella. So far, it’s been that sort of summer; we’ve had some days of bright sunshine, but not enough for happiness, but when the weather is being co-operative, one of the ways we most enjoy making the most of it is to have a picnic. And while you can picnic with some flabby sandwiches pulled out from soggy cardboard packaging, it’s much nicer and more of an event to whip up one or two treats ourselves. 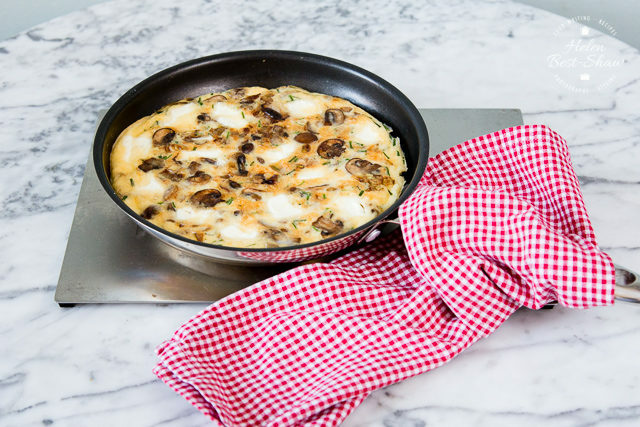 One of our favourite picnic foods is a frittata: it avoids the extra time and hassle of making pastry, but has that eggy richness that we so enjoy, is easy to both make and transport, as well as eat on the go. The robustness of a frittata, and the lack of crumbs, make it the perfect snack for journeys and car picnics – simply cut into wedges and pack into a plastic tub. 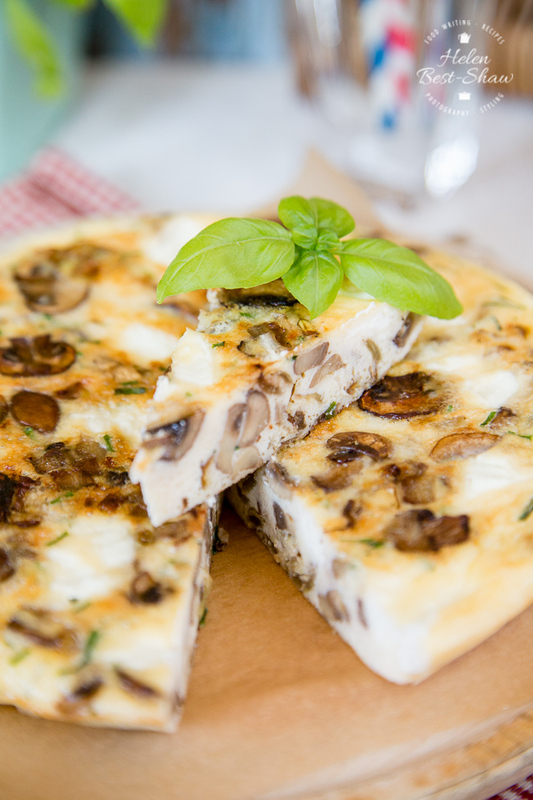 Mushrooms are perfect for this frittata. Most supermarkets now stock a variety of mushrooms, which the gives the option of a greater range of flavours, textures and colours than the ubiquitous white button, and also you do not need to spend lots to buy a variety. Here, we’ve used some baby chestnut mushrooms, for a nutty flavour as well as the economical button variety. 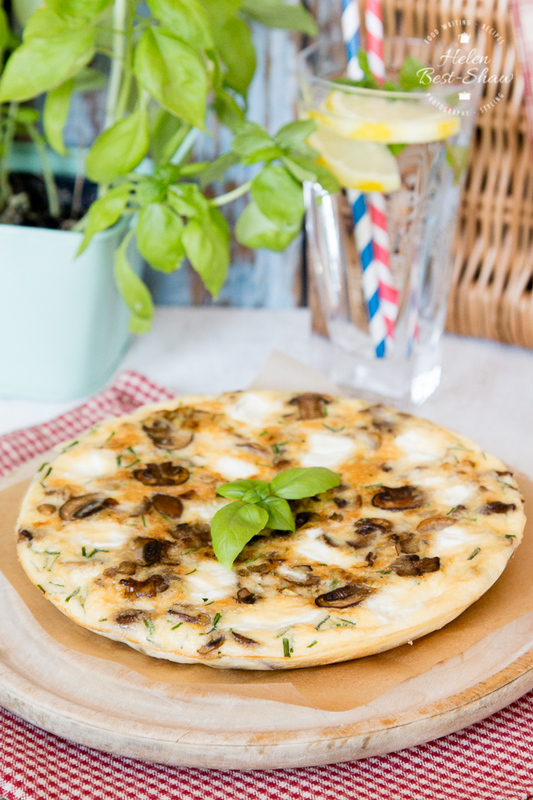 Mushrooms are so versatile, as well as amazingly good in so much more than just wintery casseroles; what could be more summery than a picnic blanket and a plate of salad and frittata? As well as being super tasty mushrooms are packed with vitamins and protein, are low in fat and count towards one of your 5-a-day. Win, win, win for the mushroom! Soft goat cheese bakes well, and with the addition of some cheddar this is a cheesy delight. We prefer to dot the goats cheese into the frittata just before baking, rather than blend it into the egg mixture, but it’s easier to incorporate the cheddar the other way round: simply grate it into the mixture. But the cheese is really a supporting act to the main event in this dish: the mushrooms. Love Fritattas? Then check out my leftover chicken crittata or my three ingredient salmon frittata. 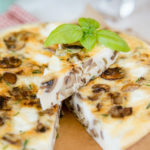 If you try this Mushroom frittata with goat cheese please tag #FussFreeFlavours on Instagram or Twitter. It is amazing for me when for me when you make one of my recipes and I really do love to see them. You can also share it on my Facebook page. Please pin this recipe to Pinterest too! Thanks for reading Fuss Free Flavours! Dice and fry the onion in a large pan until translucent. While the onion is cooking, slice the mushrooms, then add to the pan. Season and fry. Using a large pan allows the liquid in the mushrooms to evaporate easily; cook until the mushrooms are coloured. Break the eggs in a bowl, and grate in the cheddar cheese, mix well. 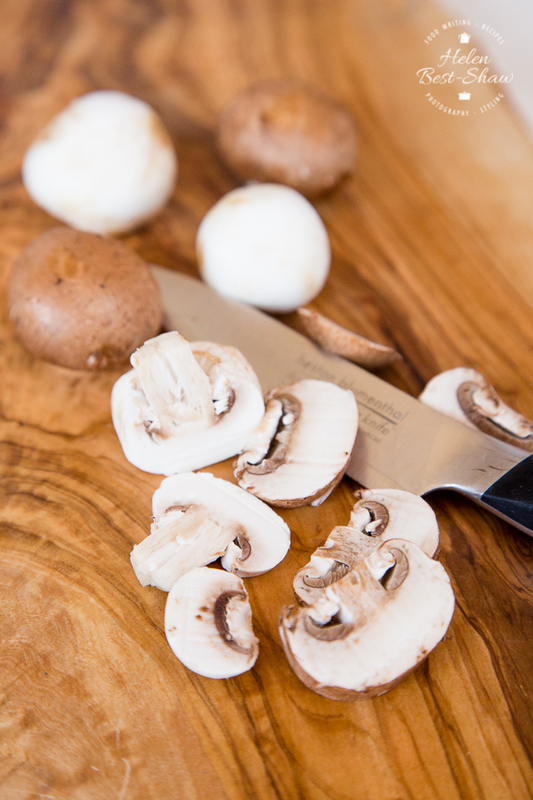 Dry the the mushroom and onion mix with some kitchen paper or a tea-towel, and add to an oiled 8” frying pan. Pour over the egg and cheese mix, and dot the top of the mixture with small cubes, about 1 cm on each side of goat cheese. Cook on a low heat until the frittata is cooked around the edges of the pan, but is still liquid in the middle. Finish under the grill; it’s cooked with the top has browned and puffed up. Enjoy hot or cold.